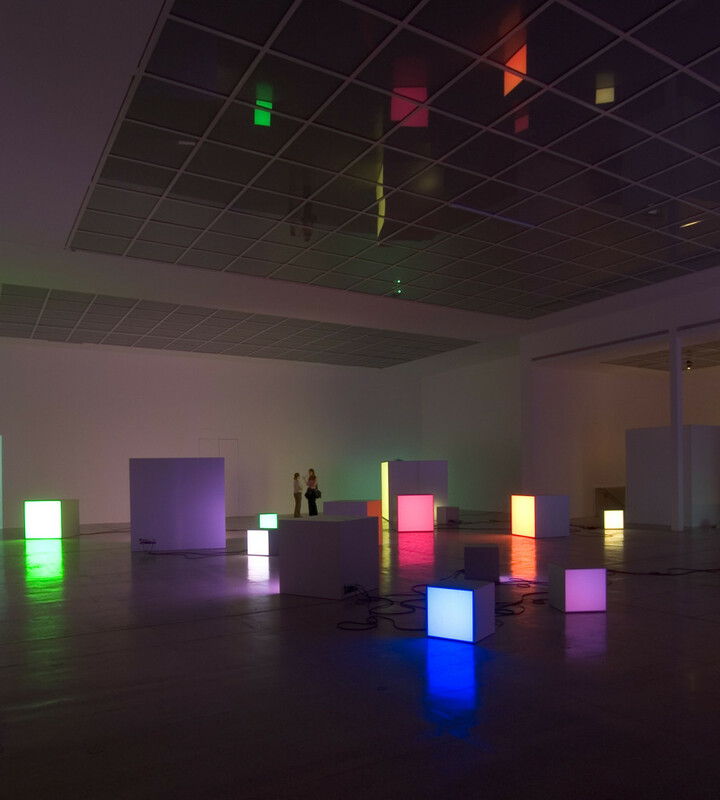 Systems of rules and ordering principles–structures that organize our surroundings and our behavior–are a central theme in the work of Angela Bulloch. 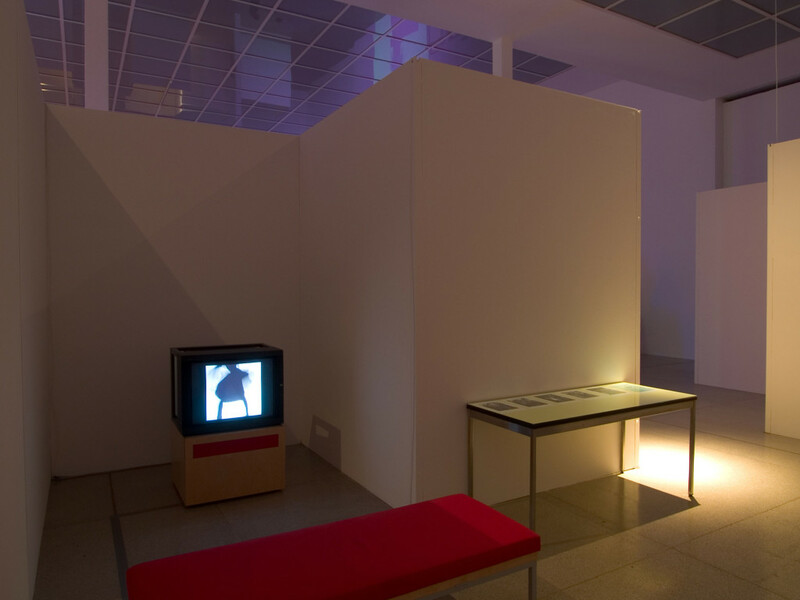 The artist combines light, sound, text, video, and objects to create multidisciplinary installations that explore interconnections between digitality and historical Modernism. 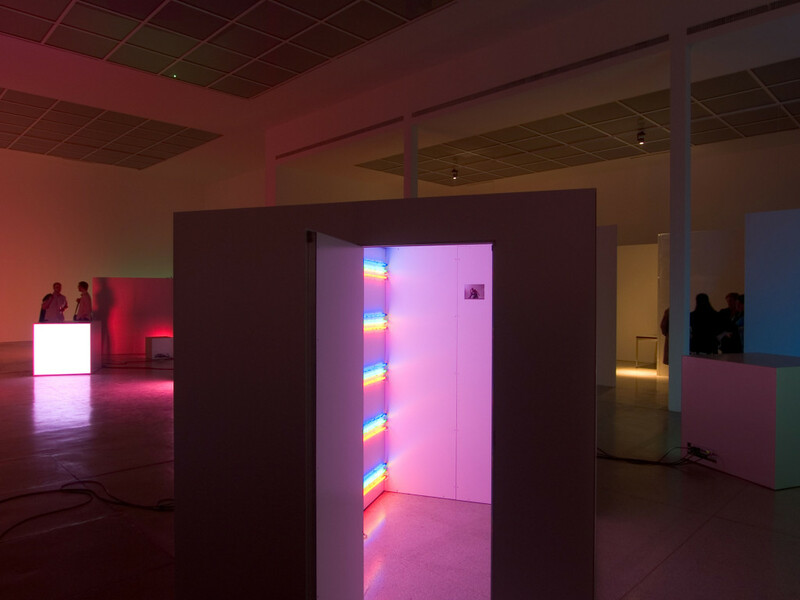 One concrete implementation of this issue is the Pixel Box, a three-dimensional object that can be programmed like a 16-million-color monitor by means of a modular RGB light system. Pixel stands for “picture element” and is the smallest unit in the display of a screen image. 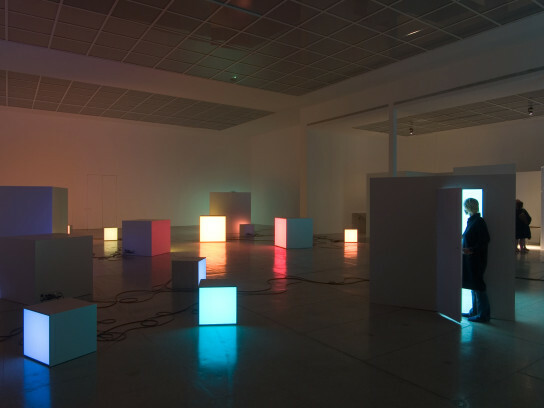 The rectangular form of the pixel box is also reminiscent of Minimal Art, such as works by Dan Flavin or Donald Judd with their focus on geometry, reduction, and color compositions. At the Secession, Angela Bulloch is showing a new series of pixel boxes. The boxes are both architecture and figure, and this synthesis–a classic avant-garde interface–is the focus of To the Power of 4., as the show is entitled. 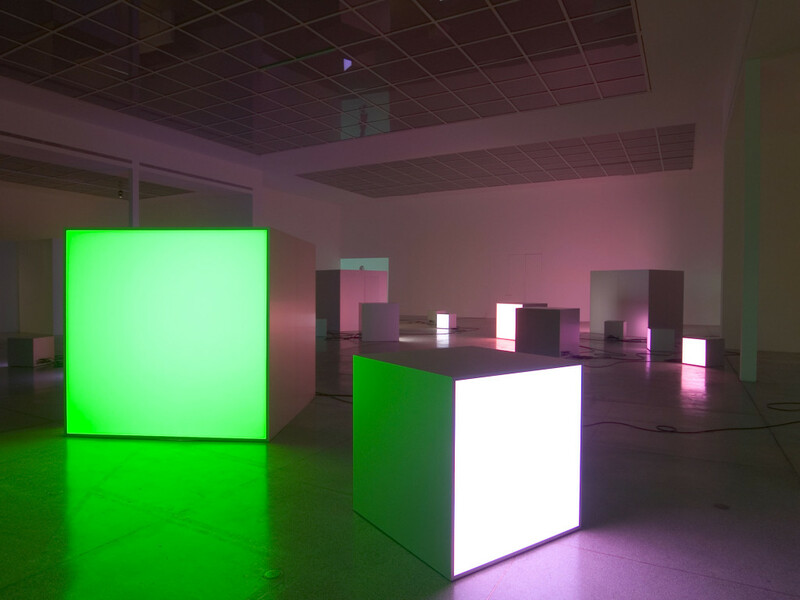 Angela Bulloch works with the tension between geometrical grid patterns (floor and ceiling design in the main space, form of the box) and organic bodies, extending their relationship by means of projections onto and into the boxes. In this context, the factors of “time” and “movement”, like the notion of the “pixel”, are to be understood not as physical units but as a logical principle–as a conceptual space. Life-size projections of a dancer, an actor, and a performance artist, on one of the aluminum-clad outside surfaces, give the boxes individual character. The choreographies and the way they are shown on/in the box refer to historical and contemporary forms of experimental theatre and expression. Arranged loosely in an open, stage-like mise-en-scène, the pixel boxes break the geometrical order of the space. Angela Bulloch combines the series of three large boxes with two smaller formats. Each of the three groups follows a visible, inner logic: the connecting wires create spatial links between the boxes, while color and rhythm establish visual relations. 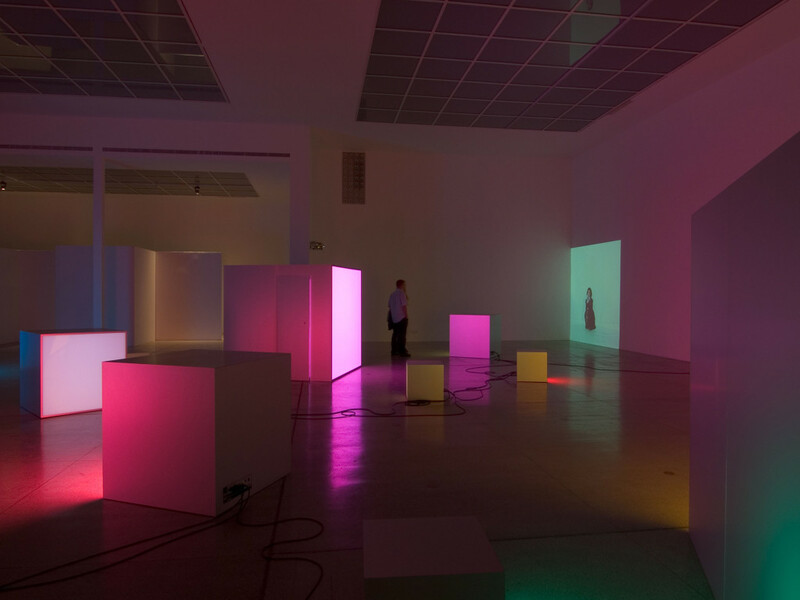 In the side aisles, Angela Bulloch uses the gallery’s own wall system to create maze-like zones for further works: Flexible Single (Lobster/Tilleul) (2001) and Video Sound System (1997/2004) are both display systems. Like the pixel boxes, these works are characterized by the relationship between body, architecture and mediality. The multipart installation Flexible Single (Lobster/Tilleul) comprises a series of twelve tables, six short and six tall, each in six different colors. On each short and tall table of the same color, a print of a lobster or a garden is presented under glass. For the Secession, Angela Bulloch has selected eight tables: they can be recombined in numerous ways, serving the artist as a display for further works–including print-outs and posters–that are closely related to the overall concept of the show. Video Sound System (1997/2004)is a set of monitors and benches forming an architecture for the viewing of videos that was originally designed for the London Electronic Art Gallery (LEA). Video Sound System can be used as a flexible display for different videos selected by the artist to fit each specific exhibition context. In the piece’s reduction to the bare essentials, film also becomes an experience that is visual and physical, phenomenological and social. 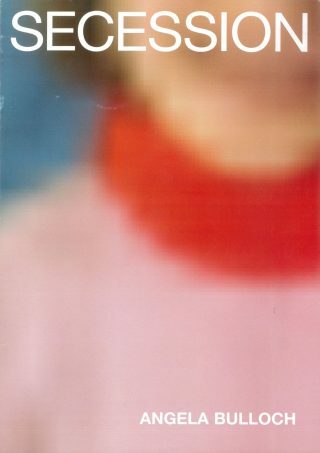 Angela Bulloch, born in Rainy River in 1966, Canada, lives and works in London and Berlin.